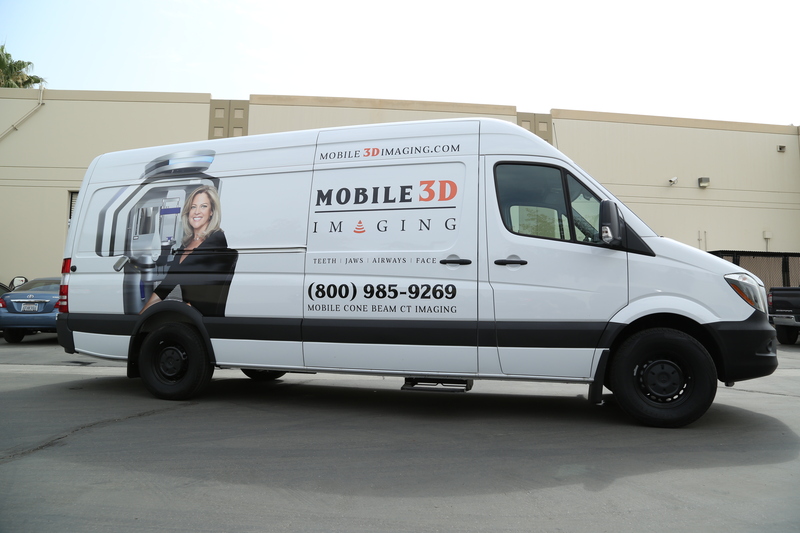 Equipped with the newest Prexion Cone Beam, Our mobile CT scan vans are custom made for mobile scanning. As a result, Our mobile CT scan vans are at the forefront of the imaging revolution. From start to finish, the whole process should take less than 30 minutes. Finally, scans are ready for review within 15 minutes. In order to review the scan, a link or a CD is sent to download the scan. The DICOM images needed to upload into other treatment planning software are also included. Our 3D scans show details that are invisible on 2D images, such as nerve patterns and mental nerve loops, impactions, supernumeraries, root angulations and distance between roots and adjacent teeth. We takes pride in our beautiful clean Mercedes Benz fleet of Sprinter vans equipped with the latest CBCT scanners. Our staff are friendly and strive to complete each appointment catering to the every need of their patient. Mobile 3D Imaging is the superior Mobile Cone Beam Imaging provider in Southern California. We go the extra mile to service our patients to the best of our ability! Mobile CT scan vans make life easier by bringing x-ray imaging to patients. Scans are preformed at the doctors office or the patients home or workplace. Our beautiful Mercedes Benz fleet of Sprinter vans services patients at any location. The staff are friendly and strive to complete each appointment catering to the patient. Our goal is to make Cone Beam CT Technology available and affordable for all. We believe CBCT provides valuable information in the diagnostic and treatment planning process. This includes dental implants, oral surgery, periodontics, endodontics, orthodontics, TMJ and sleep apnea. therefore, we understand the importance of making CBCT scans available to all. Furthermore, we understand that receiving and reviewing diagnostic imagery can often times be urgent. As a result, to enhance patient treatment and overall care, we offer same day appointments with raw data available immediately following a scan. Fill the Rx labslip online to complete the first step in scheduling your patients with our mobile CT scan vans. We can also help plan your dental implant surgeries and order a surgical guide. We have an All-In-One service from start to finish. Call us today and start performing implant surgeries with precision to get maximum function and aesthetic results!